The horror genre often likes to hit too close to home, to tap into the audience’s innermost fears of what could happen in everyday life. 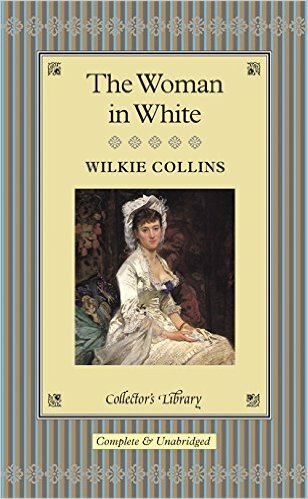 One novel that first tapped into that fear is the 1860 sensation novel The Woman in White, by English author Wilkie Collins. We’ve covered gothic novels in Book-Inspired fashion posts before, including works like Wuthering Heights and The Thirteenth Tale. 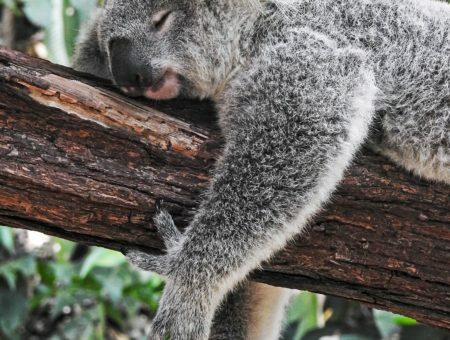 But a sensation novel is a different animal. Though it shares many qualities with gothic literature, sensation is its own unique genre – its themes and plots are based on horrifying acts of betrayal and murder, drawn from real-life situations rather than the supernatural. The Woman in White follows Walter Hartright and his lady love Laura Fairlie, who are separated by social class and Laura’s engagement to the cold Sir Percival Glyde. Laura’s half-sister Marian helps them fight for their happiness against the machinations of Sir Glyde, Laura’s uncle Frederick Fairlie, and Sir Glyde’s sinister Italian friend Count Fosco. Throughout the novel there is also the presence of the mysterious Anne Catherick, a spooky woman who only wears white, who floats in and out of the plot. So now that you know the basics of the novel, let’s dive into fashion inspiration from The Woman in White! The Woman in White is considered one of the first “detective novels” because of the amateur sleuthing of the protagonists Walter Hartright and Marian Halcombe. While actual police detectives play no part in the story, the plot is based a lot on solving the mystery of Anne Catherick as well as the shady dealings of Sir Glyde and Count Fosco. Spring has just arrived, but summer is soon approaching, so wear this outfit to go solve a mystery in the warm weather! A basic graphic tee and jean shorts are comfortable and functional, as are these sandals. This beach bag will hold your essentials, while ear cuffs and a cocktail ring add some fun. Wrap everything up with a floppy hat and some sunglasses. Every novel has a fan favorite character, and The Woman in White is no different. Marian Halcombe is resourceful and nuanced while still remaining sympathetic to the audience. While other characters are losing their wits over heartbreak, Marian is the only one who has it together. That doesn’t mean she’s without emotion or weaknesses, but she is certainly a compelling character to read about. Marian is described as the plain faced spinster sister of Laura, but with a sharp mind and figure that captivates Count Fosco and others. This keyhole dress is figure-flattering and sensible, as are these fabulous shoes and mint crossbody bag. For a boho flair, add dangly earrings. To polish off the look, highlight your cheekbones with coral blush, tint your lips with coordinating lip gloss, and open your eyes with some good mascara. Every good novel needs a great villain. While Count Fosco has a few disgusting habits and is overtly threatening to everyone around him, he manages to have an air of sophistication and intelligence that captivates those he meets, including Marian. Even though he is not connected to many of the main characters for the first chunk of the novel, his character becomes essential to the plot later on. Say what you will about his character, but this Italian count has style in spades. 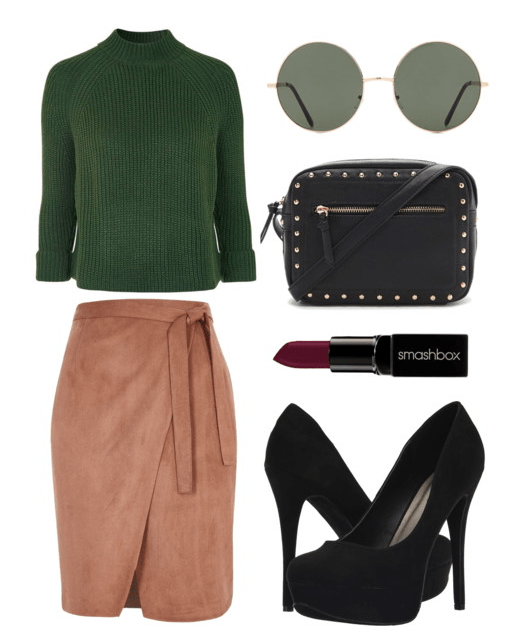 For a clean, European look, keep the color palette dark and neutral with a green turtleneck top and a suede wrap skirt. This studded crossbody is edgy without being too much and these round sunglasses are effortlessly cool. Finish off the look with simple pumps and dark lipstick for an outfit inspired by this classic villain. The eponymous woman in white is actually named Anne Catherick, a mysterious woman whom Walter Hartright comes across on the road during her escape from an asylum. Anne is a wild card; because her background is murky, she looks exactly like Walter’s love interest Laura, and you’re not sure whether or not she’s crazy. While Anne’s presence is gothicly influenced, she is very much human, and one of her main character traits is her penchant for wearing – you guessed it – all white. A light, white dress is perfect for spring, while this blazer gives it a bit of polish. These jeweled white shoes are super girly while being comfortable, and finally these knotted hearts symbolize the wants of the heart in this emotional novel. So what did you think? Have you read The Woman in White? Did you like it? What books would you like to see us do next? Let us know in the comments below! Previous Quiz: Which Bird Represents Your Style?